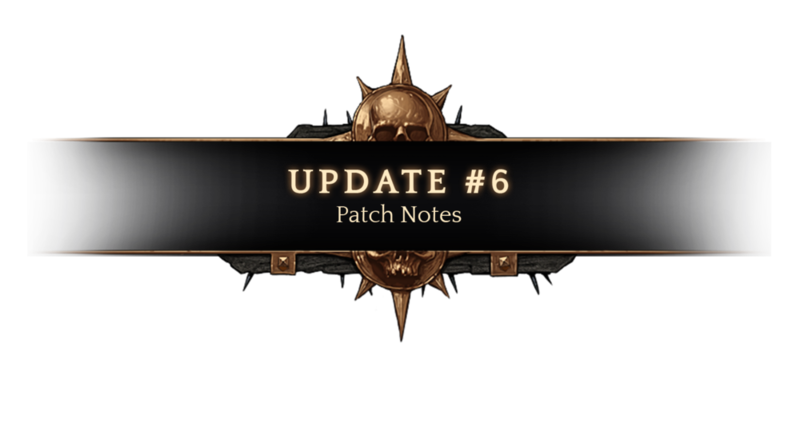 Welcome to update #6 for Vermintide 2. Introducing Mouse Keyboard Support and major re-balancing of weapons, traits, enemies, and more. Fixed issues where the burning head VFX could persist if a player transitioned into another state. Fixed a crash that could occur when the cannon ball at Fort exploded. Fixed an issue where the game could crash if a player left the game while being revived. Fixed cases where the First Person camera sway would remain if player performed an interaction (or died) whilst moving. Fixed a case where players could get disconnected when near the Bridge of Shadows. Fixed a clipping issue with Saltzpyre’s Legacy skin.Fixed an issue where the fast shot mode of Brace of Pistols would get a smaller crosshair after shooting one bullet, or when starting to move. Added a small movement speed slowdown on ground fire damage. Increased initial damage tick from ground fire, players should no longer be able to run through the stormfiend flame without taking any damage. Increased the damage that players and enemies take from the ground fire. Increased duration of the ground flames from 6 seconds to 8 seconds. Decreased the duration of the dot from the flamethrower from 5 seconds to 3 seconds. Decreased damage from flamethrower dot by about 50%. Leech will now teleport back to its target after teleporting away from being damaged after 5 to 7 seconds, decreased from the previous 10 to 12 seconds. Initial skulk time after spawning is still 10 to 12 seconds. Fixed Sorcerer not playing idle animation after summoning is done and no targets are available. Fixed an issue where enemies would continue to follow after an invisible player. Lohner will now only ask the player to hurry up whilst the Bridge of Shadows is activated. Fixed an issue where sound states from bots Career Skills could affect the servers sound state, leading to cases where for example special stingers could be missed or suppressed. If scrounger procs for 1 bonus ammo on your last shot, you will be unable use that ammo until you swap weapon. Gaining temporary health pauses temp health decay for 3 seconds. Removed stamina regain burst when gaining temp health. Dodge improvements have been made to make them more reliable across the board. Increased light attack damage by 33% for attack three and four. Increased light attack stagger power by 72% for attack three and four. Increased heavy attack damage against first target hit by 45%. Increased heavy attack stagger power against first target by 45%. Increased heavy attack damage versus Infantry, Monster and Frenzy by 51%. Increased first two light attacks damage by 28%. Increased stagger strength and duration for third light attack by 42%. Changed push followup to heavier version – effectively increasing cleave, damage and stagger across the board. Tuned movement curve for light combo finisher to provide a burst of speed. Increased Stamina from 3 to 4 shields. Increased range of light attacks slightly. Increased light combo attack speed. Increased damage and stagger for first two targets of heavy combo sweeping attacks by 47%. Increased stagger strength and duration for downward light attack by 72%. Infantry damage increased by 33%. Increased damage for sweeping light attacks by 28% verus Infantry, Monsters and Frenzy. Increased damage vs armored for light stab attack by 100%. Increased attack speed and tuned chain actions across the board to provide fast and smooth combos. Added new slam mechanic to first heavy attack, providing better aim and three tiers of targets: Single aimed target, small AoE toward front of attack and large AoE hitting everything in front. First heavy attack now light all enemies hit on fire, causing them to burn for additional damage. First heavy attack now ignites the primary targets hit, causing them to burn for greater additional damage. Increase damage for Heavy attacks by 8%. Increased stagger strength for Light attacks by 72%. Increased light attack Infantry damage by 33%. Reduced damage of secondary targets hit by 50%. Increased Heavy attack damage by 8%. Increased stagger strength for downward light attack by 72%. Increased Infantry damage of downward light attack by 33%. Introduced separate damage profile for downward light attack, secondary targets with reduced impact across the board. Fixed an issue where light attack chain would cause a bit of damage on all targets hit rather than only the first handful. Increased attack speed of third light attack. Removed precision targeting from all light attacks. Increased Infantry damage of light attacks by 39%. NOTE Previously referred to heavy attacks being increased, this was incorrect. Increased Armored damage of light attacks by 11%. NOTE Previously referred to heavy attacks being increased, this was incorrect. Increased Monster damage of light attacks by 41%.NOTE Previously referred to heavy attacks being increased, this was incorrect. Increased Frenzy damage of light attacks by 12%. NOTE Previously referred to heavy attacks being increased, this was incorrect. Increased stagger power of light attacks by 57%.NOTE Previously referred to heavy attacks being increased, this was incorrect. Increased cleave of third light attack by 205%. Third light attack has new attack profile. Cleaves through more enemies but deals less damage compared to the first two attacks. Reduced armor penetration on push followup attack. Increased damage for light attacks by 7%. Incresed damage cleave for heavy attacks, causing damage to more targets. Increased efficent dodge count from 1 to 2. Increased damage versus armor on max charged attacks by 69%. Increased power multiplier for push followup attack by 8%. Increased stagger strength of max charged heavy attacks by 207%. Decreased damage cleave for light sweeping attacks. Reduced the time required for charged heavy attack to chain while tuning movement curve to be a bit smoother. Increased attack speed thoughout the weapon. Reduced cleave on all shots by 25%. Increased light attack damage versus Infantry, Monster and Frenzy by 12%. Increased light attack damage versus armor by 55%. Increased heavy attack damage versus Infantry, Monster and Frenzy by 12%. Reduced heavy attack damage versus armor by 20%. Increased stagger strength for light attacks by 25%. Reduced crit/headshot effectiveness for all attacks. Switched push-follow up damage profile to match light swings (but you get two of em). Reduced cleave on all shots by 33%. Remade horizontal heavy sweep into a crowd controlling attack, greatly increased cleave while maintaining a solid damage output against first targets. Increased light attack damage versus infantry by 33%. Slightly increase power multiplier for downward Heavy attack. Reduced stamina regen delay after pushing from 1.5 to 0.75 seconds. After pushing, shields start recovering stamina 50% faster than other weapons. Increased first heavy attack damage versus infantry, monster and frenzy by 51%. Increased first heavy attack damage versus armored by 283%. Switch push followup attack damage profile to lighter version with less power across the board. Increased push attack damage versus infantry by 53%. Increased push attack damage versus armored by 31%. Increased push attack damage versus monsters by 23%. Increased push attack damage versus frenzy by 24%. Increased push attack damage versus super armor by 31%. Increased push attack stagger power by 66%. Increased light attack damage versus Infantry, Monsters and Frenzy by 14%. Increased light attack stagger strength by 22%. Increased stagger strength and duration of heavy attacks by 29%. Gave heavy attacks a increased crit chance of 20%. Gave light attacks ability to slide past armored enemies. Made it easier to open shield users with light attacks. Slightly increased attackspeed across the board. Increased heavy stab attack damage by 29%. Increased heavy sweep attack damage versus armored by 66%. Reduced heavy sweep attack damage versus monsters and frenzy by 24%. Increased damage of light attack stab by 25%. Reduced attack speed for all attacks. Increased animation speed for heavy attacks. Reduced cleave for first level of charged shot. Increased damage versus Infantry, Monster and Frenzy for slashing light attacks. Increased damage of Heavy stab versus Infantry, Monster and Frenzy by 20%. Increased damage of Heavy stab versus Armored by 84%. Changed push followup to a lighter version of the stab. Slightly increased range of attacks across the board. Increased mobility and range across the board. Increased power for downward Heavy attacks by 8%. Increased upward Heavy attack power by 10%. Increased damage vs armored for the Light stab attack by 100%. Decreased crit/headshot damage for upward Heavy attack vs armored enemies. Reduced damage vs armor on Light attack chain by 36%. Increased damage vs armor on second Heavy attack by 52%. Increased damage on first Heavy attack by 8%. Tuned attack turnaround with faster light attacks and slightly slower push attack. Increased heavy attack power versus infantry, monsters and frenzy by 28%. Increased heavy attack power versus armored by 181%. Increased range for all attacks. Gave push followup and increased crit chance of 25% and better cleave modifier while making a bit faster. Reduced damage on Heavy attacks by 20%. Introduced separate damage profile for secondary targets of light attacks without bleed DoT (only one target get the DoT per attack). Increased damage of sweep heavy attack versus infantry, monster and frenzy by 10%. Increased damage of sweep heavy attack versus armored by 10%. Reduced damage on stab Heavy attacks versus Infantry and Frenzy by 20%. Reduced damage on stab Heavy attacks versus monsters by 10%. Increased damage vs armored on light stab attacks by 100%. Reduced push cost for sword and dagger from 2 stamina(1 shield) to 1 stamina (1/2 shield). Introduced separate damage profile for secondary targets of light stab attacks without bleed DoT (only one target get the DoT per attack). Changed damage profile of the dagger attack for the first heavy attack. Should now use the same profile as the sword attack. (Basically increased damage of Heavy 1). Sword and Dagger now has 10% crit chance bonus on all attacks. Increased heavy attack damage versus infantry, monster and frenzy by 8%. Increased heavy attack damage versus armored by 80%. Increased push attack damage versus armored by 100%. All attacks can slide past armor. Slowed down chain to final light attack slightly. Increased critical strike chance bonus of 3rd and 4th attack to 25% and 50% respectively. Removed 10% critical strike chance modifier of first and second light attacks. Increased damage of light attacks versus infantry, monsters and frenzy by 25%. Increased damage of Heavy stab by 29%. Increased damage vs armor for Heavy sweeping attack by 66%. Reduced damage versus Monster and Frenzy for heavy sweeping attack by 24%. Added damage vs armor to light stabs. Decreased damage of light attacks by 4%. Increased Infantry damage of third light attack by 33%. Increased attack power of Heavy attacks by 10%. Increased stagger power by 14%. Increased range and stagger of offhand pistol slightly while making it fire a bit quicker after input. Reduced damage versus infantry, monsters and frenzy by 8%. Increased damage versus armor by 37%. Increased stagger power by 45%. Reduced spread of primary shot. Increased spread of secondary shot. Reduced movement speed slow while aiming from 65% reduction to 15%. Increased normal shot monster damage by 33%. Increased spin-up attack damage by 38%. Increased spin-up attack stagger power by 107%. Increased Infantry, Monster and Frenzy damage by 19%. Increased Armored damage by 62%. Increased reload time from 1.3 to 1.6 seconds. Increased shotgun damage versus monsters by 33%. Increased range of push attack from 2 to 2.5 meters. Fixed an issue where the charged attack used the wrong attack template, causing it to deal damage to armored targets. Non-critical hits no longer damages Chaos Warriors. Now only staggers them. Increased charged flame Infantry damage by 77%. Increased charged flame Armored damage by 100%. Increased charged flame Monster damage by 64%. Increased charged flame Frenzy damage by 60%. Increased charged flame stagger power by 100%. Primarily versus Armored. Morale Boost – Cooldown reduced from 180 seconds to 90 seconds. Drillmaster – New Talent: Replaces For the Empire! : Striking multiple enemies in one swing grants temporary health based on the number of targets hit. Max 5 enemies. Mercenary’s Pride – New Talent, replaces Soldier’s Spirit: Melee killing blows grants temporary health based on the health of the slain enemy. Captain’s Command – New Talent, replaces The Harder They Fall: Healing yourself with a First Aid Kit or a Healing Draught also heals your nearby allies for 20% of their maximum health. Removes any wounds. Perk – Deep Pockets: Increases maximum ammunition carried by 50%. Note: This has always been the case but the perk was never displayed previously. Taste of Victory – New Talent: Replaces For the Empire! : Staggering an enemy with a melee attack grants temporary health. Health gained is based on the strength of the stagger. Huntsman’s Tally – New Talent, replaces Soldier’s Spirit: Melee killing blows grants temporary health based on the health of the slain enemy. Taal’s Bounty – New Talent, replaces The Harder They Fall: Healing yourself with a First Aid Kit or a Healing Draught also heals your nearby allies for 20% of their maximum health. Removes any wounds. Back Off, Ugly! – New Talent: Replaces For the Empire! : Staggering an enemy with a melee attack grants temporary health. Health gained is based on the strength of the stagger. Bloody Unstoppable! – New Talent: Replaces For the Empire! : Striking multiple enemies in one swing grants temporary health based on the number of targets hit. Max 5 enemies. Templar’s Rally – New Talent, replaces The Harder They Fall: Healing yourself with a First Aid Kit or a Healing Draught also heals your nearby allies for 20% of their maximum health. Removes any wounds. Ingenious Improvisation – New Perk: Using any Healing Supplies, Potions or Bombs has a 10% chance to not consume the item. Stacks with similar effects. Roots Running Deep – New Talent: Replaces Just Drunk Enough: Staggering an enemy with a melee attack grants temporary health. Health gained is based on the strength of the stagger. Ranger Reaper – New Talent: Grudge-Borne: Striking multiple enemies in one swing grants temporary health based on the number of targets hit. Max 5 enemies. Hardy Heart – New Talent, replaces Grimnir’s Champion: Healing yourself with a First Aid Kit or a Healing Draught also heals your nearby allies for 20% of their maximum health. Removes any wounds. Catch a Breath – Increased temporary health gained when activating Diseagage from 20 to 50. Ranger’s Ambush – Reworked: Moving outside of the Smoke Bombs area does not break invisibility. No longer increases the duration of Disengage. Impenetrable – Reduced cooldown from 180 to 120 seconds. Grudge-Borne – Reworked: Melee killing blows grants temporary health based on the health of the slain enemy. Rock-Breaker – New Talent: Replaces Just Drunk Enough: Staggering an enemy with a melee attack grants temporary health. Health gained is based on the strength of the stagger. Hearthguard – New Talent, replaces Grimnir’s Champion: Healing yourself with a First Aid Kit or a Healing Draught also heals your nearby allies for 20% of their maximum health. Removes any wounds. Doomseeker – New Talent: Just Drunk Enough: Striking multiple enemies in one swing grants temporary health based on the number of targets hit. Max 5 enemies. Slayer’s Fury – New talent, replaces Grudge-Borne: Melee killing blows grants temporary health based on the health of the slain enemy. Trueflight Volley – Cooldown increased from 70 seconds to 80 seconds. Weavebond – Reworked: Melee critical strikes and headshots grant 2 temporary health. Critical headshots restores twice as much. Martial Blessing – New talent, replaces Khaines Thirst: Melee killing blows grants temporary health based on the health of the slain enemy. Eternal Blossom – New Talent, replaces Champion of Loren: Healing yourself with a First Aid Kit or a Healing Draught also heals your nearby allies for 20% of their maximum health. Removes any wounds. Lifebloom Arrows – Increased temporary health gaines when using Trueflight Volley from 20 to 50. Spirit Echo – New talent, replaces Weavebond: Striking multiple enemies in one swing grants temporary health based on the number of targets hit. Max 5 enemies. Dryad’s Thirst – New talent: Killing enemies grants temporary health based on the health of the slain enemy. Ariel’s Boon – New Talent, replaces Champion of Loren: Healing yourself with a First Aid Kit or a Healing Draught also heals your nearby allies for 20% of their maximum health. Removes any wounds. Khaine’s Thirst – Reworked: Melee killing blows grants temporary health based on the health of the slain enemy. Bleak Vigour – New talent, replaces Weavebond: Melee critical strikes and headshots grant 2 temporary health. Critical headshots restores twice as much. Blood Kin – New Talent, replaces Champion of Loren: Healing yourself with a First Aid Kit or a Healing Draught also heals your nearby allies for 20% of their maximum health. Removes any wounds. Base health increased from 100 to 125. Base critical strike chance increased by 5%. Animosity – Cooldown reduced from 180 to 90 seconds. Marked for Death – Now grants all allies attack speed when a taggable enemy dies. Bonus attack speed reduced from 10% to 5%. Justice’s Bounty – Increased temporary health gained from 2 to 3. Wild Fervor – Now grants bonus critical strike chance to all allies when a taggable enemy dies. Reduced bonus critical strike chance from 8% to 5%. Hunter’s Ardour – New talent, replaces Holy Cause: Melee critical strikes and headshots grant 2 temporary health. Critical headshots restores twice as much. Walking Judgement – New talent, replaces Righteous Zeal: Striking multiple enemies in one swing with a melee weapon grants temporary health based on the number of targets hit. Max 5 enemies. Disciplinarian – New talent, replaces Purifier: Healing yourself with a First Aid Kit or a Healing Draught also heals your nearby allies for 20% of their maximum health. Removes any wounds. Blessed Shots – No longer resets on melee kill. Cruel Fortune – Now reduces the cooldown of Blessed Shots to 6 seconds, was 7. Inspired Shot – New talent, replaces Pious Fervour: Melee killing blows reset the cooldown of Blessed Shots. Blood for Money – New talent, replaces Holy Cause: Melee critical strikes and headshots grant 2 temporary health. Critical headshots restores twice as much. Tithetaker – New talent, replaces Righteous Zeal: Melee killing blows grants temporary health based on the health of the slain enemy. Paymaster – New talent, replaces Purifier: Healing yourself with a First Aid Kit or a Healing Draught also heals your nearby allies for 20% of their maximum health. Removes any wounds. Sigmar’s Herald – New talent, replaces Holy Cause: Striking multiple enemies in one swing with a melee weapon grants temporary health based on the number of targets hit. Max 5 enemies. Repent! Repent! – New talent, replaces Righteous Zeal: Melee killing blows grants temporary health based on the health of the slain enemy. Font of Zeal – New talent, replaces Purifier: Healing yourself with a First Aid Kit or a Healing Draught also heals your nearby allies for 20% of their maximum health. Removes any wounds. Fire Walk – Increased the radius of the lingering fire of Fire Walk by 100%. Tranquility – Now only resets when casting a spell. Reduced delay from 8 to 6 seconds. Tranquility – Increased the vent rate of Tranquility from 200% to 300%. Burnout – Reworked: Now allows Fire Walk to be used a second time within 5 seconds before going on cooldown. Lingering Flames – New talent, replaces Flickerform: Siennas burning effects now last until the enemy dies. Maximum stacks reduced to 1. Confoud – New talent, replaces Seething Embers: Staggering an enemy with a melee attack grants temporary health. Health gained is based on the strength of the stagger. Spark Thief – New talent, replaces Soul Snare: Melee killing blows grants temporary health based on the health of the slain enemy. Flame-Fettled – New talent, replaces Blazing Harvest: Healing yourself with a First Aid Kit or a Healing Draught also heals your nearby allies for 20% of their maximum health. Removes any wounds. The Burning Head – Increased cooldown from 40 to 60 seconds. Spark Smith – New talent, replaces Seething Embers: Striking multiple enemies in one swing with a melee weapon grants temporary health based on the number of targets hit. Max 5 enemies. Spirit-Binding – New talent, replaces Soul Snare: Melee killing blows grants temporary health based on the health of the slain enemy. Fiery Fortitude – New talent, replaces Blazing Harvest: Healing yourself with a First Aid Kit or a Healing Draught also heals your nearby allies for 20% of their maximum health. Removes any wounds. Bonded Flame – Increased temporary health gained when using Burning Head from 20 to 50. Dissipate – Reworked: Block cost is reduced by 50% when overcharged and blocking vents Overcharge. No longer reduces damage taken from venting. Conduit – Reduced vent speed from 50% to 30%. Also reduces damage taken from venting by 50%. Soul Quench – New talent, replaces Seething Embers: Staggering an enemy with a melee attack grants temporary health. Health gained is based on the strength of the stagger. Reckless Rampage – New talent, replaces Soul Snare: Striking multiple enemies in one swing with a melee weapon grants temporary health based on the number of targets hit. Max 5 enemies. Burn-Bloom – New talent, replaces Blazing Harvest: Healing yourself with a First Aid Kit or a Healing Draught also heals your nearby allies for 20% of their maximum health. Removes any wounds. Natural Bond – No longer prevents using healing items. Natural Bond – Changed from 2 health every 10 seconds to 1 health every 5 seconds. Heat Sink, Reworked – Now refunds the overheat spent on the attack when a critical strike is triggered. Scrounger – Reworked: Now restores 5% of your maximum ammunition on a critical hit. Can only trigger once per shot. Resourceful Combatant – Reworked: Melee critical strikes reduces the cooldown of your Career Skill by 5%. Effect can only trigger once every 4 seconds. Resourceful Sharpshooter – Reworked: Ranged critical hits reduces the cooldown of your Career Skill by 5%. Effect can only trigger once every 4 seconds. Natural Bond – Reworked: Provides health regen, healing yourself with healing draughts and first aid kits only heals for temporary health. Still clears any wounds. Barkskin – Reworked: Taking damage reduces the damage you take from subsequent hits by 40% for 2 seconds. This effect can only trigger once every 2 seconds. This damage reduction is calculated after other effects such as career perks. Hand of Shallya – Increased healing from Hand of Shallya from 35% to 50% of missing health. Added some stagger resistance to Ratling Gunner, should ignore the weakest hits now. Rotation should be delayed further for enemy dodged/completed attacks, making everything look and work better. Stormvermin with shields should now stay “open” for longer/more hits once their guard is broken. Stormvermin with shields should no longer block attacks from invisible enemies. Dodge time window increased to 1.5 seconds for normal enemy attacks. Heavy cleaves and most elite enemy attacks changed to 3 seconds.